Today I'm going to talk about one of the most irritating, annoying and frustrating problems I have ever encountered while using laptops. The problem occurs while typing some text. It doesn't matter what and where are you typing, you might be typing in Microsoft Word or a web browser or anywhere else. When you are typing some text, the mouse cursor automatically jumps to a different location and if you don't notice it and keep typing, you may end up with an unpredictable document which might look written in an alien language. First I thought that its a problem in my laptop but then I searched on Internet, I found there are many people who have faced the same problem while using a laptop with touchpad. Most of them were using laptops of Dell, HP or Sony. So its definitely a problem present in some laptops and not in your hands. So what's the solution? How to fix this annoying cursor jumping problem? Here is the answer! I found that a freeware "TouchFreeze" can fix this problem. It has been suggested by lots of people in Microsoft communities as well. TouchFreeze is a free software which automatically disables the touchpad of your laptop as soon as you start typing. Since the touchpad is disabled, the cursor will not jump automatically while typing. You just need to install the software and it'll sit in system tray. Its very simple to use and doesn't need any configuration. If you want to close it, you can right-click on its icon in system tray and select exit option. Windows 8 and later operating systems come with a built-in option to prevent accidentally moving cursor while typing. You can find this option in PC Settings (Metro Control Panel). 1. Open Charms Bar by moving your mouse cursor to top-right or bottom-right corner of screen and then click on Settings option. 2. Now click on "Change PC settings" option given at the bottom. 3. It'll open Metro Control Panel or PC Settings page. Now go to "PC and devices -> Mouse and touchpad". 4. Now you just need to change the value of "To help prevent the cursor from accidentally moving while you type, change the delay before clicks work" option. First change its value to "No delay (always on)". If it doesn't work for you, try to change its value to "Long delay". It should permanently disable the annoying cursor jump problem. Question 1: What is Cloud Computing? Cloud Computing = Software as a Service + Platform as a Service + Infrastructure as a Service. Commodified: The result is a utility computing model similar to traditional utilities, like gas and electricity; you pay for what you need! Question 2: What are the components of Cloud Computing? Storage-as-a-Service: This is the component where we can use or request storage. It is also called disk space on demand. Database-as-a-Service: This component acts as a live database from remote. Information-as-a-Service: Information that can be accessed remotely from anywhere is called Information-as-a-Service. Process-as-a-Service: This component combines various resources such as data and services. This happens either hosted within the same cloud computing resource or remote. Application-as-a-Service: Application-as-a-Service (also known as SAAS) is the complete application built ready for use by the client. Platform-as-a-Service: This is the component where the app is being developed and the database is being created, implemented, stored and tested. Integration-as-a-Service: Integration-as-a-Service deals with the components of an application that has been built but must be integrated with other applications. Security-as-a-Service: This is the main component many customers require. There are three-dimensional securities found in cloud platforms. Management-as-a-service: This is a component that is mainly useful for management of the clouds, like resource utilization, virtualization and server up and down time management. Testing-as-a-Service: Testing-as-a-Service refers to the testing of the applications that are hosted remotely. Infrastructure-as-a-Service: This is called as nearly as possible the taking of all the hardware, software, servers and networking that is completely virtual. Question 3: What is the Service Model in Cloud Computing? Every service model offers you some kind of resource required to operate the most web-enabled systems imaginable. Question 4: What are the kind of cloud storage and why is cloud computing is so popular? In this model a service provider makes resources, such as application and storage, available to the general public over the internet. Public cloud services may be free or offered on a pay-per-usage model. A private cloud provides more control over the company's data and under the control of the company's IT department. A hybrid cloud is a combination of public cloud storage and private cloud storage, where some critical data resides in the enterprise's private cloud and other data is stored and accessible from a pu blic cloud storage provider. Lower costs, "Pay as you use"
Question 5: What is the Windows Azure Platform? Question 6: What is Windows Azure and explain its services? This is Microsoft's platform as a service that supports the Multi-tier applications and automated deployment. Question 7: What are the roles available in Windows Azure? Roles are an important concept in Windows Azure and learning them is the base for further programming. There are mainly three roles in Windows Azure. It provides a web front-end solution. This is similar to an ASP.NET application. While under hosting Azure provides IIS and required services. It provides a background service solution. This can be thought as a windows service application. We can use this role to run background operations like database management tasks, report generation, etc. It can run lengthy operations. According to MSDN, the Web Role can be considered as a Worker role loaded with IIS. Similarly the worker role can be used to host other application platforms. The Web Role and Worker Role are executed on virtual machines. The Virtual Machine Roles provides the user the ability to customize the virtual machine on which the web and worker roles are running. The VM role runs a virtual hard disk (VHD) image which can be created and uploaded by the user. Through t he VM role the customers can run scheduled tasks and other windows services. Question 8: What is Windows Azure Portal and also explain the Azure Fabric? Question 9: What are the three main components of Windows Azure Platform? Windows Azure provides platform and infrastructure by providing a scalable and cost-effective computing, storage, and networking resources on demand. Windows Azure has three main components in Azure: Compute, Storage and Fabric. Worker roles used for background processing of web roles. Virtual Machine (VM) roles used for migrating windows server applications to Windows azure in an easy way. Windows Azure Drives (VHD) to mount a page blob. These can be uploaded and downloaded via blobs. Question 10: What are the differences between a public cloud and a private cloud? Private clouds are those that are built exclusively for an individual enterprise. They allow the firm to host applications in the cloud, while addressing concerns regarding data security and control that is often lacking in a public cloud environment. It is also known as an internal or enterprise cloud and resides on the company's intranet or hosted data center where all of your data is protected behind a firewall. Pay for whatever resource you need at whatever time period. Supports heavy workloads without disturbing any functionality. It is very cheap for the consumers, since the hardware, application and other costs are handled by the providers. There is no wasted resource because consumers are charged for what they use. Scalability is always met here. It is owned by a specific private group for their own use of employed, partners and their own customers. Highly controlled and not accessible by anyone other than allowed. Security, governance and compliance is highly automated. Similarly, the features are like a Public Cloud irrespective of security and maintenance. Question 11: What do you understand about Hybrid Cloud? Explain in detail. A hybrid cloud is a mixture of internal and external cloud services, a combination of a private cloud combined with the use of public cloud services. This type of cloud is most suitable when you want to keep the confidential data at your premise (private cloud) and consume the other services from a public cloud. Scalability:Usually the Private Cloud services will have a lesser scalability due to its security, cost and compliance whereas the Public Cloud has a high scalability and moving non-sensitive data from the private to the public will free up resources in the data centers in the Private Cloud and that increases a very high scalability for a Hybrid Cloud. Cost effective: Similarly the Public Cloud is very cost effective rather than Private Cloud and here the Hybrid Cloud provides cost effectiveness with the data and other sensitive operations secured. Flexibility: We can easilyove out m the non-sensitive data and manage large scalability using a Public Cloud service along with the Private Cloud. So with the availability of a large scalability using Public Cloud and security using Private Cloud an enterprise has a vast opportunity in developing for new needs. Question 12: What is Diagnostics in Windows Azure? Windows Azure diagnostics provides facility to store diagnostics data. Some diagnostics data is stored in a table, while some is stored in a blob. For collecting diagnostics data, we must initialize the Windows Azure diagnostic monitor. The Windows Azure diagnostic monitor runs in Windows Azure and in the computer's emulator and collects diagnostic data for a role instance. Crash Dumps wad-crash-dumps These are the logs generated on the application crash. Question 13: What is Azure Queues? It's difficult to scale up if more work is present. Your queue is doing mediator work here. If your queue is down, devices will not able to communicate with each other. Question 13: What is the difference between Windows Azure Queues and Windows Azure Service Bus Queues? Windows Azure Queue Storage is a service for storing a large number of messages that can be accessed from anywhere using HTTP or HTTPS. A single message can be up to 64KB in size. So, a queue may contain millions of messages. It is basically a part of Windows Azure Storage and enabled with a REST based architecture. Service Bus queues support brokered messaging communication. Queues provide First In, First Out (FIFO) message delivery, in other words messages are received and processed by the receivers in the order they were added to the queue. Each message is received and processed by only one message receiver. Question 14: How can you create a Queue in storage account? Question 15: What is a Storage keys? To avoid this type of situation, a secondary access key is provided so that if the primary needs to be changed or regenerated we can map the secondary temporarily to the storage and regenerate the primary. Let us see step by step of how to get the Access Keys using Windows Azure Management P ortal. Question 16: What is the concept of the table in Windows Azure? Question 17: How to send messages to a Queue and how to receive messages from a Queue? Messages sent to (and received from) Service Bus queues are instances of the BrokeredMessage class.BrokeredMessage objects have a set of standard properties (such as Label and TimeToLive), a dictionary that is used to hold custom application specific properties, and a body of arbitrary application data. An application can set the body of the message by passing any serializable object into the constructor of the BrokeredMessage, and the appropriate DataContractSerializer will then be used to serialize the object. Alternatively, a System.IO.Stream can be provided. The easiest way to receive messages from a queue is to use a QueueClient object. These objects can work in two different modes: ReceiveAndDelete and PeekLock. When using the ReceiveAndDelete mode, reception is a single-shot operation; that is, when the Service Bus receives a read request for a message in a queue, it marks the message as consumed, and returns it to the application. The ReceiveAndDelete mode is the simplest model and works best for scenarios in which an application can tolerate not processing a message in the event of a failure. To understand this, consider a scenario in which the consumer issues the receive request and then crashes before processing it. Because the Service Bus will have marked the message as being consumed, when the application restarts and begins consuming messages again, it will have missed the message that was consumed prior to the crash. Question 18: What are the Storages in Windows Azure? Question 19: What is Federation inSQL Azure? Federation is introduced in SQL Azure for scalability. Federation helps both administrators and developers to scale data. It helps administrators by making repartitioning and redistributing of data easier. It helps developers in the routing layer and sharding of data. It helps in routing without application downtime. Federation does basic scaling of objects in a SQL Azure Database. Federations are the partioned data. There can be multiple Federations within a database. And each Federation represents a different distribution scheme. We create a Federation with a different distribution scheme and requirement. Student and Grades tables of a School Database may have a different distribution requirement so they are put into different Federations. Question 20: What is SQL Azure Database? SQL Azure database is simply a way to get connected in Cloud Services where we can store our database into Cloud. Microsoft SQL Services and Microsoft SQL Data Services are now known as Microsoft SQL Azure and SQL Azure Database. Microsoft Azure is the best way to use PAAS (Platform as a Service) where we can host multiple databases on the same Account. < /p>Microsoft SQL Azure has the same feature of SQL Server, i.e. high availability, scalability and security in the core. Microsoft Azure SQL Database have a feature, it automatically creates backups of every active database. Every hour a backup is taken and geo-replicated to enable the 1 hour recovery point objective (RPO) for Geo-Restore. Additionally, transaction log backups are taken every 5 minutes to enable Point in Time Restore. Question 21: What are SQL Azure firewall rules? SQL Azure firewall rules are provided to protect the data and to prevent access restrictions to the SQL Azure database. Firewall grants access to the originating IP's from which we are trying to access the database. In order to configure the firewall we need to configure a range of acceptable IP addresses upon which we try to connect to the SQL Azure server using the Management Portal or with the SQL Server Management Studio. Let us see the step by step process of adding and deleting rules as per our IP configurations. All access to SQL azure is blocked by firewall. By default Database created in SQL Azure is blocked by firewall for security reasons. Any attempt from external access or access from any azure application is blocked by firewall. Question 22: What is Windows Azure Traffic Manager? What are its benefits? Traffic Manager Name is itself self-explanatory. It allows users to control the distribution of user traffic of deployed Azure cloud services, Azure websites or any other endpoint. In this the distribution of traffic includes Azure cloud services, Azure web sites and other endpoints. There are 3 different load balancing methods provided by Azure. The Traffic Manager works by applying an intelligent routing policy engine to the Domain Name Service (DNS) queries on your domain names and maps the DNS routes to the appropriate instances of your applications. Increase Performance: Can increase performance of your application that includes faster page loading and better user experience. This applies to the serving of users with the hosted service closest to them. High Availability: You can use the Traffic Manager to improve application availability by enabling automatic customer traffic fail-over scenarios in the event of issues with one of your application instances. No Downtime Required for Upgrade / Maintenance: Once you have configured the Traffic Manager you don't need downtime for application maintenance, patch purgation or complete new package deployment. Easy to configure (Quick Setup): It's very easy to configure Azure Traffic Manager on Widows Azure portal. If you have already hosted your application on Windows Azure (a cloud service, Azure website) you can easily configure this Traffic Manager with a simple procedure (setting routing policy). Question 22: What are the data synchronize services in Azure? Synchronize a SQL Azure Database from an Azure Server to a Local Server database. Question 23: How can you manage SQL Azure security? Users: Database level, mapped to server logins. Schemas: Database level, authorized/owned by a user or another schema. Roles: Database level, authorized/owned by a user or another role. Permissions: Database level, permission like SELECT, DELETE, ALTER and so on for objects/schemas granted to users/roles. When you create a server in SQL Azure, it asks you to create a login at the same time. That login acts as the administrative login that has access to all the databases in that server. However, you might want to create other logins with less privilege. As of now, the SQL Azure portal doesn't have any UI to create these extra logins. So you'll need to resort to running T-SQL statements. Note: All of the following procedures are done using the administrative login mentioned above. Login to the master database and run the following T-SQL statement. Question 24: What are the different types of databases in SQL Azure? Best suited for Web application, Departmental custom applications. Best suited for Saas ISV applications, custom Web application, Departmental applications. Question 25: What is TFS build system in Azure? In layman's terms a build server acts as the machine where you put your deployment packages. Question 26: What is the difference between IaaS and PaaS in Cloud? Infrastructure as a Service (IaaS): is in effect much like building a set of services and virtual machines and networks in a Cloud as the user would On-Premises. Platform as a Service ( PaaS): A Platform is a cloud that gives the user various frameworks, tools and services on the cloud and the user are building the application in the cloud leveraging these various tools, services and components within the application. Granularity of Control of Virtual Machines The user can remote into virtual machine running in the cloud using IDP. The user has the same level of control as the user would with a virtual machine on-premises. This means the user can get into the registry, install custom software the user want to install on that virtual machine. The PaaS provider takes care of running the application. It means that the user doesn't get access to registry and neither can the user install custom software necessarily in that application or in the location where it runs. PaaS providers provide the infrastructure and the platforms. Control over the environment configuration The user can choose a certain number of virtual cores, virtual CPUs, RAM, networking set up, how many different networks, virtual VPNs, separate subnets, extensions to on-premises networks and load-balancing across multiple VMs. PaaS can be thought of as the next step of IaaS where the configurations is also done for the user by the provider. Maintenance The user is responsible for the O/S, patching, firewall management, security, data, runtime, applications, middleware and everything that's running inside of the VM because the user is responsible for that virtual machine. The only difference is the location of the VM; instead of on-premise it is in the cloud. The user still gets to do all the configurations but the user is relieved of doing the physical hardware things. The provider is responsible for application/services on PaaS. The user is just managing the various services. Scalability The user is responsible for scalability. Scalability is the responsibility of the PaaS provider. Pricing Subscription Model. Subscription Model, but it includes the cost of hardware for the installation of PaaS. Both IaaS and PaaS help organizations to minimize operational costs and increase their productivity as they get faster time to market and require no up-front investments. Question 27: What is the Azure App Service? What are the advantages of App Service over Mobile Service? Azure App Service is a fully managed Platform as a Service (PaaS) offering for professional developers that brings a rich set of capabilities to web, mobile and integration scenarios. Mobile Apps in Azure App Service offer a highly scalable, globally available mobile application development platform for Enterprise Developers and System Integrators that brings a rich set of capabilities to mobile developers. Simpler, easier and more cost effective offering for apps that include both web and mobile clients. New host features including Web Jobs, custom CNames, better monitoring. Turnkey integration with Office 365, Dynamics CRM, Salesforce, and other vital SaaS APIs. Support for Java and PHP backend code, in addition to Node.js and .NET. Turnkey integration with Traffic Manager. Connectivity to your on-premise resources and VPNs using VNet in addition to Hybrid Connections. Monitoring and troubleshooting for your app using NewRelic or AppInsights, as well as alerts. Richer spectrum of the underlying compute resources, e.g. VM sizes. Built-in staging, backup, roll-back, and testing-in-production capabilities. Question 28: How can you demonstrate between Azure mobile service and Web API? Web API: Web API is used only for that client who uses HTTP enabled services. There is a problem with Web API, if you want to create a Web API service, then you need knowledge of ASP.NET solution and you need to be familiar with .Net. Azure Mobile Services: Windows Azure Mobile Service is a tool that can integrated with the Windows Azure cloud. This tool will help you to connect a cloud backend to your Windows 8 application. The goal of the Windows Azure Mobile Service is to make Windows Azure the obvious choice for the Windows 8 Metro style application developer. Currently we can only use the Windows Azure Mobile Service in Metro style applications but in the near future the mobile service can also work with iOS, Android and Windows Phone. Question 29: What is Google Cloud Platform? Google Cloud Platform is a new way to use cloud computing platform in real time. It is developed by Google and offers every developer the chance to host their Web API's and Cloud Storage and many more things on the same supporting infrastructure that is used by Google itself internally in their products, such as Google Search, Google Play Store, Gmail and YouTube. Also for every product by Google, Google Cloud Platform provides developer products to build application and a range of programs from simple websites to complex applications. Google use Load Balancer technique that allows distributing cloud data into multiple data centers all over the world. With the help of Google Cloud BigQuery we can execute billions of queries per second. Question 30: What is the VM (Role) and VM (Pass)? VM Role: VM role is a kind of role in the Azure platform which helps to maintain service packs, patches, updates and applications already installed, to Windows Azure automatically. Long-Running Setup: If the application requires a long-running setup. Error-Prone Application: Application in which you expect more errors/risks while installing it. VM (IaaS): These are literally VMs as we understood then from the On-Premise running in the Azure Microsoft Data Center. IaaS VMs is that you can take just about any on-premises application, whether it makes changes to the local file system or not (even if the OS is one of the supported Linux distributions) and deploy it to the cloud for a few cents per hour. Provisioning time will be increased. Automatic OS/software updates will be there in the (IaaS) VM. Question 31: What is Virtual Machine in Azure? Google Cloud Platform Compute Engine is Google's Infrastructure-as-a-Service (IaaS), which is used to run large-scale workloads on virtual machines hosted on Google's infrastructure. It is used by Google itself for their end user products, such as Google search, YouTube and for all products of Google. Allows you to choose a VM with a specific requirement of hardware configurations with a list of server operating systems and now it also allow Windows Server. Azure Virtual Machines could be your choice if you want frequent modifications and changes in your web server environment. It provides you rich set of features; however, correctly configuring, securing and maintaining VMs require much more time and more IT expertise compared to Azure Cloud Services and Azure Websites. You will need to make more effort on frequent maintenance and update patches to manag e the VM environment. Question 32: How to create a Virtual Machine in Azure? Step 1: Log in to your Azure management portal. Step 3: Select "Compute" -> "Virtual Machine" -> "From Gallery". Step 4: Select the Operating System that you would like to install on the VM. In this scenario we will install a Ubuntu server 13.04 because then it will be easy for me to continue with the later posts on creating a PHP app on our new VM. Step 5: The next window will ask you about user details, VM RAM and number of cores and a name for the VM. Fill them in as you wish. I will use a password instead of a SSH key. Step 6: Next window ask you about cloud configuration (DNS Setting) and Storage account and Region. Except for region leave the rest as it is unless you know what you are doing. Step 7: Now we will need to create end points for us to access the VM. For now let's keep SSH access only. Step 8: Then the VM will be created and will be running after a few minutes. You can see it in your Azure portal. Question 33: What is Autoscaling in Azure? Autoscaling Application Blocks can automatically scale the Windows Azure application based on the rules defined specifically for the application. Instance Autoscaling, where the block changes the number of role instances based on constraint and reactive rules. Throttling, where the application modifies its own behavior to change its resource utilization based on a set of reactive rules. For example switching off non-essential features, or gracefully degrading its UI. Constraint rules: Constraint rules set the upper and lower bounds on the number of instances. For example, in the evening between 6:00 and 8:00, you need a minimum of 3 instances and a maximum of 7 instances, then use the constraint rule. Reactive rules: Reactive rules enable the number of role instances to change in response to unpredictable changes in demand. For example, if the workload increases then increase the number of role instances by 1. The reactive rules can use a variety of techniques like performance counters, or the Windows Azure queue length to monitor and control the application's workload. A reactive rule makes changes to the number of role instances only if a constraint rule applies at the same time. It is easy to create a default constraint rule that always applies. Question 34: What is AWS Cloud Formation? AWS Cloud Formation is a cloud builder service that helps you model and set up your Amazon Web Services resources so that you can spend less time managing those resources and more time focusing on your applications that run in AWS. For this you need to create a template that describes all the AWS resources that you want, like Amazon EC2 instances that you want, Amazon VPC and subnet details and so on. AWS CloudFormation takes care of provisioning and configuring those resources for you. You don't need to individually create and configure AWS resources and figure out what's dependent on what, AWS CloudFormation handles all of that. AWS CloudFormation is available at no additional charge. You will be billed only the normal rates for the AWS resources like EC2, RDS, LB and so on that AWS CloudFormation creates and your application and resources use. Question 35: What is profiling in Azure? Profiling is nothing but a process of measuring the performance analysis of an application. It is usually done to ensure that the application is stable enough and can sustain heavy traffic. Visual Studio provides us various tools to do it by gathering the performance data from the application that also helps in the troubleshooting issues. Once the profiling wizard is run, it establishes the performance session and collects the sampling data, then generates report files that can be opened and analyzed in Visual Studio. Determine the longest running methods within the application. Measure the execution time of each method in the call stack. Analyze concurrency issues (usually for multi-threaded code). Question 36: How can you connect an Azure Hosted website to FTP? Stop: Stopping the virtual server. Restart: It will restart the server if something gone wrong. Mange Domains: If upgrade from free account to basic or standard account you can manage your domains here. Delete: It will delete entire website. WebMatrix: To link website to WebMatrix. Monitor: Graphical representation of request, cuptime, data in, data out. Configure: Change the language setting version used. WebJobs: Automatic task that are scheduled will be discussed in upcoming articles. Scaling: More than one instance of website can be created to balance load. This will show how the resources are attached. You will see the cleardb database if you click on it will redirect you to cleardb website and you will be automatically logged into account created by azure for you. You can view performance and other configurations of your database. If we want to view files of our WordPress in order to change configuration setting, upload content or to make backup. For this we have to set some deployment credentials in Microsoft Azure so that Azure verifies that we are authorized to make changes. For this go to Management portal select website. Dashboard of app will be opened. If not, click on setup deployment credentials. Question 37: What is Cmdlet in Azure? A cmdlet is a lightweight command that is used in the Microsoft PowerShell environment. The Windows PowerShell runtime invokes these cmdlets within the context of automation scripts that are provided at the command line. The Windows PowerShell runtime also invokes them programmatically through Windows PowerShell APIs. A cmdlet is a compiled piece of .NET code. Cmdlets handle object input and output as well as usually playing nice and well with the (object-based) pipeline. Cmdlets have no direct representation in the file system, as they are not programs or similar. They exist solely within PowerShell. You can use the Get-Command Cmdlet to query all available Cmdlets, functions, etc. Go to Microsoft Azure home page. The installation can take several minutes because there is a dependency on the Microsoft Azure SDK, which has its own set of dependencies. Question 38: What is Azure Explorer? Azure Explorer is a free Microsoft Azure storage tool; in this we can manage all our Microsoft Azure blobs at a common place or one place. Azure Storage Explorer is a useful GUI tool for inspecting and altering the data. In Azure Explorer, we have "Azure Storage Account", and in the Azure Storage Account, we can manage more than one Blob Container, in Blob Container we can create page blob as well as new folders to store our files. Step 1: For the installation of Azure Explorer we need go to its download link, After going to above link, you will see the following window. Click "DOWNLOAD AZURE EXPLORER". Question 39: What is Service Fabric in Azure? Azure Service Fabric is a next-generation middleware cloud platform to build scalable, reliable, and managed enterprise applications. Microsoft is already using Service Fabric powers in many of its products, including Azure SQL Database, Azure DocumentDB, Cortana, and Power BI. Develop with a "datacenter on your machine" approach. The local development environment is the same code that runs in the Azure datacenters. Develop applications composed of microservices, executables, and other application frameworks of your choice, such as ASP.NET, Node.js, etc. Develop stateless and stateful (micro)services and make these highly reliable. Simplify the design of your application by using stateful (micro)services in place of caches and queues. Deploy to Azure or to on-premises clouds running Windows Server with zero code changes. Write once and then deploy to any Service Fabric cluster. Question 40: What is Windows Azure Scheduler? Windows Azure Scheduler allow you to invoke actions – such as calling HTTP/S endpoints or posting a message to a storage queue on any schedule. With Scheduler, you create jobs in the cloud that reliably call services both inside and outside of Windows Azure and run those jobs on demand, on a regularly recurring schedule, or designate them for a future date. Scheduling is the history details of your apps in the cloud; it gives information of the particular application, means its status, its start time and its end time. Question 41: What is Blob Storage in Azure? Windows Azure Blob Storage can store hundreds of terabytes data in one account. As you know you can create multiple blob storage accounts, so definitely you can store multiple hundreds of terabytes data with Windows Azure Blob Storage. We don't require taking tension about the backup of the data which is stored on blob storage. It is because it automatically takes the backed up data. You can increase your storage as per requirement and you need to pay only which you have used and what you have used. One more thing, that you don't need to take headache about how to manage your data, your VM or any other things; actually Windows Azure manages everything automatically. You can use Blob Storage as REST API and can use with any language like Java, .NET, etc. Actually technology doesn't matter with blob storage. It means all kinds of client can be accessible to this storage. Question 42: Why do you go with Microsoft Windows Azure? Flexibility: Windows Azure supports wide range of Operating System that makes it reachable to wide range of customers. It also supports different kinds of programming language like PHP, .NET, JAVA, etc. You can use different kinds of frameworks and tools for building your Apps. So, basically it provides us flexibility to choose existing one which will help us to create variety of applications with Windows Azure. Extendable: Windows Azure easily integrates with your existing environment using largest network with secure private connectivity. It also provides database, storage which is extendable on demand. Windows Azure can run with your data center. Scalable: You can scale up and down your services as per your demand. Services, storage and performance also will be same if you scale up or down. So, small client can take benefit of Windows Azure and their services. Protection: Everyone is worried about their data. They need protection for their data, nobody can rely on some vendor for their data. Windows Azure has launched Azure Government for believing you that your data is secure with Windows Azure. It commits for securing, protecting and privacy of your data. Trusted: Today Windows Azure is used by top clients worldwide. They are using Windows Azure Services for a long time and they believe in it. Question 43: What is Azure Mobile Service? Microsoft Azure Mobile Service gives you the power to create a cloud service mobile application. This will make your work more flexible and gives your application more portability in an efficient way. This is a short introduction of Azure Mobile service. You will get to know, how to create and integrate new mobile service in your new or existing application. So let's get crack in Azure Mobile Service with Universal Windows Platform. Question 44: What is the difference between Table, Queue, and Blob storage? To use Azure Storage, you just need to have an Azure Storage Account. Using this account you can access the service of the Azure Storage. Actually Azure Storage provides two types of the storage account. Standard Storage Account: It is for Blob, Table, and Queue Storage. Premium Storage Account: It is for Azure Virtual Machine Disks Only. BLOB STORAGE: It can store any type of data; data can be a document file, media file, exe or dll, images, text file or any other data file. So, basically it is used for storing the objects. So, as the definition says, we can store large amount of the unstructured data into the blob storage. TABLE STORAGE: It is like a table inside the SQL Server. So, it is used to store the structured data. Table storage is a NoSQL key-attribute data store. It means every data stored into the table is stored with typed property name. It is very fast when you are working with large number of data. It doesn't use schema for developing the table. QUEUE STORAGE: Sometimes, it is required to transfer the data in the format of the message over the internet between the two cloud services. In that scenario we prefer to use the queue storage. You can create large number of the queues to process your data. Every queue contains lar ge number of the message and every message size may be up to 64 KB. Question 45: What isthe Migration Assistant tool in Azure Websites? The migration Assistant tool will help to analyze your IIS installation and identify which sites can be migrated to the cloud, highlighting any elements which cannot be migrated or are unsupported on the platform. Once analyzed this tool will also create websites and databases provided under given azure subscription. This tool will provide a high level readiness assessment. The report outlines sites which are ready to move, elements which may need changes and highlights unsupported features. The tool creates any Website(s) and associated database(s), if applicable, automatically and synchronizes your content. Question 46: What is Azure Mobile Engagement? Azure Mobile Engagement is a SaaS-delivered, data-driven user engagement platform that enables real-time fine-grain user segmentation, app user analytics, and contextually-aware smart push notifications and in-app messaging across all connected devices. Real Time actionable analytics to increase app usage. Push Notification and Communication Platform. Open API's and Ease of integration. Data Protection & Privacy across globe. Azure Mobile Engagement is available across all major mobile platforms including Android, iOS and Windows. Question 47: What is WordPress in Microsoft Azure? WordPress is Web software you can use to create a Web sites, blog, or apps. The core software is built by hundreds of community volunteers, and when you're ready for more, there are thousands of plugins and themes available to transform your site into almost anything you can imagine. Click on Next: Fill in information about MySQL database. Azure will choose the unique name of your database and region to place the database physically. Question 48: What is Azure HDInsight? Both Linux and Windows clusters in HDInsight are built on the same standard Hadoop distribution and offer the same set of rich capabilities. Question 49: How can you create a HDInsight Cluster in Azure? To create an Azure HDInsight Cluster, open the Azure portal then click on New, Data Services, then HDInsight. Hadoop is the default and native implementation of Apache Hadoop. HBase is an Apache open-source NoSQL database built on Hadoop that provides random access and strong consistency for large amounts of unstructured data. Storm is a distributed, fault-tolerant, open-source computation system that allows you to process data in real time. The next step is to add a cluster name, select the cluster size, add a password, select a storage and click on create HDInsight cluster. Click HDINSIGHT on the left pane. You will see a list of deployed HDInsight clusters. Click the HDInsight cluster that you want to connect to. From the top of the page, click CONFIGURATION. From the bottom of the page, click ENABLE REMOTE. In the Configure Remote Desktop wizard, enter a user name and password for the remote desktop. Note that the user name must be different from the one used to create the cluster (admin by default with the Quick Create option). Enter an expiration date in the EXPIRES ON box. Question 50: What is Text Analytics API in Azure Machine? Text Analytics API is a suite of text analytics web services built with Azure Machine Learning. The API can be used to analyze unstructured text for tasks such as sentiment analysis and key phrase extraction. The API returns a numeric score between 0 & 1. Scores close to 1 indicate positive sentiment, while scores close to 0 indicate negative sentiment. The advantage of this API is that a new model need not be designed and trained, the user only needs to bring the data and call the service to get the sentiment results. However, because this is only the initial release of this service only English is supported right now. Text Analytics API does not simply use a lexicon approach to map words such as "good or bad" to return the results. Instead, it uses advance d natural language processing techniques under the hood. In this article you will get to know about Azure MarketPlace. In this article we are going to learn the Azure Market Place and what exactly you can achieve with it. What exactly is the Azure MarketPlace? In this article we are going to learn the Azure Market Place and what exactly you can achieve with it. In short the Azure marketplace is a store of nearly one thousand virtual machine images, developer services and more. Some are from Microsoft but most come from partners and communities. So how does it all work? Internally on Azure, we use the Azure resource manager platform to manage to deploy infrastructure in the cloud. This is done using json based templates called Azure Resource Manager Templates or ARM templates for short. They describethe what andthe how of the deployment. Deploying for the azure market place is as easy as searching for a particular VM, service or solution and clicking deploy from the gallery. You can read more about ARM Templates here. However you can simply perform the same search and deployment right from within the azure portal. So you might be wondering how the p ricing work does. It's pretty straight forward. In a case of virtual machine which is the most commonly deployed resource from the marketplace, first you pay the actual computing time, in other words you pay for the virtual machine that is hosting the solution you want to deploy. Then if the publisher has chosen to charge the fee for their solution you will pay for that. So what options doesthe publishers have and what are the ways you may or may not pay for solution from the marketplace? Currently it supports five options. The 1st is free, you pay nothing about the compute cast of your virtual machine. 2nd you have Free Trial. You get a trial of software for a period of time then if you still running it you'll be migrated to the paid subscription. 3rd BYOL or Bring Your Own License. This just means you already own a license or you have purchased one directly form the publisher and you'll use it for this deployment. The 4th option is Usage Based Billing where buyer will pay hourly fee much like you do for compute to use the software. This fee is added on the top of compute fee for your VM. The 5th option is Monthly Fee. With monthly fee you pay a flat fee per month for the software. What is in the Azure MarketPlace? So what exactly is in the Azure MarketPlace? And how does it help you get things done? Let's go over few example scenarios, starting with security. If you need antispam technology or firewall that can detect or block SQL Injections, cross side scripting, malware uploads and more. Check out Barracuda, you may read more about Barracuda here. If you need antivirus for malware protection, log inspection and intrusion detection, file integrity and more check out the solution from Trend Micro. You can read more about TrendMicro here what is it actually. There are numerous DevOps solutions in the azure MarketPlace to make is easier to build, deploy, monit or and scale your solutions. There are many solutions for continuous integration and continuous delivery. XebiaLabs, Stack Storm, Jenkins from CloudBees and Solano Labs have you covered and it all available in the Azure MarketPlace. If infrastructure in application orchestration is on your demand, check out Puppet and Chef. Both can be installed from the market place in minutes and have you well on your way. You can read more about Puppet here. What about source control, code reviews, documentations and issue tracking, check out GitLab from Bitnami, which gives you unlimited free private repositories and it is free. Azure already includes many data solutions such as Azure SQLs, Azure radios and document db. However it's not always of one size fits all and many of Microsoft partners have made their solutions available in the market place. This includes oracle, MySQL, cloudera, Hortonworks, Couchbase, mongoDB and others. What if you need more than a bare bones operating system but don't need a full blown solution in box? There are hundreds of various software stacks ready to deploy from the marketplace. Bitnami has over 80 virtual machine images to get you going including wordpress, Ruby, Node.js, Jango and more. Many readers might be novices to the industry, well you guys can take a look here about Bitnami. In Windows or Linux chances are you'll find a VM image to get you started. Why not try out the Azure MarketPlace today? 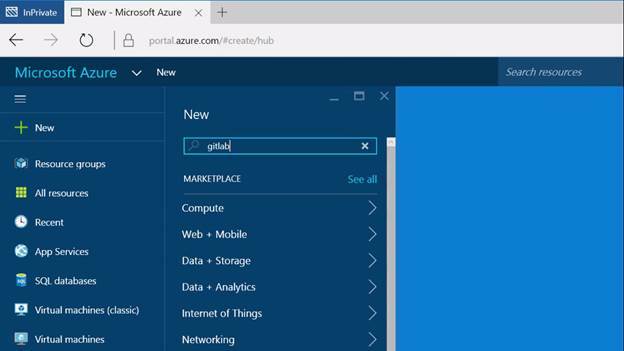 Check out the try Azure MarketPlace to get started now. Create a package for each platform that you want to target. Then you can publish each package to a store. The general settings of your app appear in the Common page of the configuration designer. The Display Name is the name that appears in the app store. The Package Name is a string that uniquely identifies your app. Choose a naming scheme that reduces the chance of a name conflict. The Domain Access collection lists the domains that your app needs to access. For example, the WeatherApp that appears in the previous image, obtains weather data from a service endpoint that has the domain https://query.yahooapis.com. The purpose of most other settings clear from the title, but you can find more information about them here: The config.xml File. Android-specific settings appear in the Android tab of the configuration designer. You can read about each option in the preference section of the config.xml reference topic. To sign your app, create a keystore. A keystore is a binary file that contains a set of private keys. Here's how you create one. In the Command Prompt, change directories to the %JAVA_HOME%\bin folder. (For example: C:\Program Files (x86)\Java\jdk1.7.0_55\bin). Replace my-release-key.keystore and johnS with names that make sense to you. You'll be asked to provide a password and the Distinguished Name fields for your key. This series of responses gives you an idea of the kinds of information you'll provide for each prompt. Like in the previous command, respond to each prompt with information that makes sense for your app. After you provide this information, output like this appears in the Command Prompt. The Android SDK generates the keystore as a file named my-release-key.keystore and places that file in the C:\ drive. The keystore contains a single key, valid for 10000 days. If you want more detail about this process, see the Android developer documentation here: Signing your applications. First, identify which version of the Cordova CLI that your project uses. That determines which configuration file you use to refer to your key. The CLI version number appears in the Platforms page of the configuration designer. You can also find it in the taco.json file at the root of your project. In Solution Explorer, expand the project folder. Then expand res->native->android and choose the ant.properties file. The ant.properties file opens in the code editor. In the ant.properties file, add the information that describes your key. Important: Don't surround these values with quotation marks (For example: "pwd123"). This can cause build errors. In Solution Explorer, expand the project folder, and then choose the build.json file. If that file is missing from your project, your project was created with an earlier version of Cordova and you should create that file manually (and populate it with content in step 2). The build.json file appears in the code editor. In the build.json file, add the information that describes your key. On the Standard toolbar, choose the Android platform. Choose the Release build configuration. Choose one of the Android emulators. Important: Don't choose any of the Ripple simulators. Choose only an Android emulator or the Device. This builds a file with an .apk file extension. That is the file that you'll upload to the store. You can find that file in the bin/Android/Release/ folder of your project. It's the file that does not contain the word unaligned in the file name. You can publish your app to Google Play. To prepare for the big day, review Essentials for a Successful App. Then, see Upload an app to make your app avaialable to the world. Download the distribution provisioning profile in Xcode. Modify the settings of your app. A distribution certificate identifies your team or organization. If your team already has one and you want to reuse it, see How to share an iOS distribution certificate. Then, skip straight to the Modify the settings of your app section. If you don't have a distribution certificate yet, continue on with this section and we'll help you set one up. If you haven't installed Xcode, see the First, install a few things onto your Mac section of the iOS setup guide. In Xcode, add your Apple ID (If you haven't done so already). See Adding an Apple ID to Your Accounts. In the menu bar, choose Xcode->Preferences. In the Accounts page, choose the View Details button. In the account details page, choose the Create button next to the iOS Distribution signing identity. Looking for more information about signing identities? See Creating Signing Identities (Optional reading). Choose the Done button to close the account details page. A distribution provisioning profile lets you submit your app to the store. On the Member Center page, choose the Certificates, Identifiers & Profiles link. In the Certificates, Identifiers & Profiles page, choose the Provisioning Profiles link. In the Provisioning Profiles page, choose the + button. In the What type of provisioning profile do you need? page, choose the App Store option, and then choose the Continue button. In the Select App ID page, choose the App ID of your app, and then choose the Continue button. In the Select certificates page, select the distribution certificate that you created earlier in Xcode, and then choose the Continue button. In the Name this profile and generate page, name your profile, and then choose the Generate button. In the Your provisioning profile is ready page, choose the Download button. In the account details page, choose the Download button next to your provisioning profile's signing identity. This identifier has to match the identifier of your distribution provisioning profile. You can find the indentier of your profile by choosing your distribution profile in the Provisioning Profiles page of the Apple developer Member Center. iOS-specific settings appear in the iOS tab of the configuration designer. Build your app to generate the package that you will submit to the store. On your Mac, make sure that the remote agent is running. See Start the remote agent on your mac. In Visual Studio, open the project for your app. This starts a build on the remotebuild agent and uses the distribution certificate and the matching provisioning profile to build a release signed iOS Application Archive (.ipa) file. You can find that file in the bin/iOS/Release folder of your project. Copy the .ipa file into a folder on your Mac. Create an iTunes Connect Record for your app. Use the Application Loader to upload your .ipa file to iTunes. Apple reviews your app. If they don't accept it, you'll receive an email that explains the reason and what you can do to fix it. These articles describe common reasons why apps get rejected. First, decide which platforms and device families you want to make your app available to. You can make your app available to Windows Phones, desktop PCs, and tablets. It doesn't matter which version of Windows the app targets. The Windows store accepts all of them. That said, the operating system of a device or PC only runs apps that target the same version of that operating system or an earlier version. To learn more about Windows package and Windows device compatibility, see OS versions and package distribution. Make your app available to Windows Phones. Make your app available to Windows desktop PCs or tablets. Install your app on a device or publish it to the store. Windows-specific settings appear in the Windows tab of the configuration designer. You might have noticed that the this page shares three of the same field names as the Common page (Display Name, Package Name, and Version). In the Create App Package Wizard (which you'll use later) you might have to choose a different display name or package name because of Windows-specific naming requirements, the name has already been reserved by someone else, or if you want to associate your app with a name that you've previously reserved. In any of these cases, Visual Studio updates the Display Name and Package Name on the Windows page once you've completed the wizard. That way your other platform targets are not forced to use those names. The reason why this page has a Version field is because Windows uses a 4 digit version number instead of a 3 digit one. You can either modify this field directly or let Visual Studio set this field based on the version number that you choose in the Create App Package Wizard. We'll look at the Windows Target Version field in the next section. In the Standard Toolbar, choose Windows-ARM. In the Windows page of the configuration designer, choose Windows 10 from the Windows Target Version dropdown list. Choose Project->Store->Create App Packages to start the packaging wizard. Find your packaging files in the AppPackages folder in the root of your project. Install your Windows app onto a device or publish it to the store. In the Standard Toolbar, choose Windows Phone (Universal). In the Standard Toolbar, choose the Release configuration. Choose Build->Build Solution to build your package. Find your packaging files in the bin\WindowsPhone8\Release folder in the root of your project. In the Standard Toolbar, choose Windows-AnyCPU. In the Windows page of the configuration designer, choose Windows 10 or Windows 8.1 from the Windows Target Version dropdown list. Complete the wizard and in the wizard choose which platforms you want to make your app available to. To publish your app to the store, see Publish Windows apps. To install your app directly onto a device Sideload your app package. We're sorry to hear that! Feel free to email our team with your question.